Arriving on the highlands of Scotland, the Turtles and Splinter begin their impromptu vacation by scaring off some local clansman going about their traditional caber tossing games. As April sees to calling her Uncle Tam MacNeil, she receives a strange vision of a castle and a sword. A spectral woman approaches her and tells her to go to Castle MacNeil on Loch Ness. 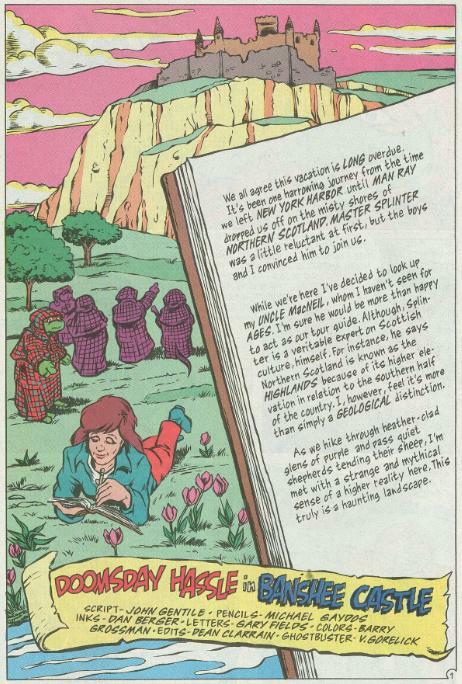 Following the spirit’s advice, April and the Turtles start toward Castle MacNeil, which happens to be owned and cared for by her Uncle. Unknown to them, they are being monitored by the Shredder and Krang, who have been following them in secret in their spacecraft. Uncle MacNeil welcomes April and her strange friends into his cottage and sits them down for a story about the castle and its bloody heritage. 300 years ago there was a girl named Elan who found a weapon called the Sword of Destiny which mysteriously fell out of the night sky. She gave it to a man she was in love with, Sandy MacNeil, as a gift. Sandy, however, was corrupt and used the power of the sword, amplified by his own evil desires, to conquer and slay his enemies. Seeing the error of her ways, Elan convinced her four sisters to help her steal the sword back. One night, after Sandy passed out from drinking too much, Elan snuck in to steal the sword out from under him. After grabbing it, though, Sandy awoke and stabbed her. Sandy escaped somewhere into the castle with the sword, but her body was never found. As punishment for their part in the plot, Elan’s four sisters were sealed in the dungeon, where they died. Ever since, the castle has been haunted by banshees and thus sealed up for centuries. April tells her Uncle of the vision she had, and realizing it was the ghost of Elan urging her toward the castle, they all decide to enter the creepy place and search for the sword; banshees or no banshees. Onboard the spacecraft, Krang is overwhelmed with joy. As it happens, 300 years ago, he shot down a Plutonian warlord in the skies over Scotland. The warlord was in possession of a weapon Krang wanted: A Plutonian Psychlotron which had the power to turn psychic aggression into a nuclear particle beam. Sadly, it was lost to him when he vaporized the warlord’s ship. Krang orders Shredder to dispatch a unit of Foot Soldiers and lay siege to Castle MacNeil, as they must obtain the Psychlotron before the Turtles. Climbing into an upper window of the castle, the Turtles, Splinter and Uncle MacNeil are immediately besieged by banshees (though April is strangley spared from their wrath). Uncle MacNeil scares them off with his awful bagpipe music, but as soon as the spirits leave, the Shredder steps in. The Shredder takes Uncle MacNeil hostage and escapes out a window. The Turtles and Splinter give chase, leaving April behind where it’s safe. Unfortunately, it was all just a diversion, as Krang enters the castle chamber and demands that April tell him where the Psychlotron is. Out in the field, the Turtles are ambushed by the Foot Soldiers while Shredder and Splinter proceed to have one of their usual epic duels. Inside the castle, Krang is swarmed by the banshees as the spirit of Elan leads April to the Sword of Destiny’s location. April follows Elan to the highest tower in the castle, and inside a nook on a narrow ledge, she finds Elan’s skeleton, clutching the sword. Elan tells April that only her pure heart is worthy of wielding the sword, as its power to channel negative emotions corrupts all others. Down in the field, the Turtles trash the Foot Soldiers while Splinter chases Shredder into the spacecraft. It takes off and flies close to April, who slashes it open with the sword. Shredder and Splinter fall out of the gash, landing inside the tower at the same time Krang arrives. They take Splinter hostage and demand the sword in exchange for his life. April hurls the sword into Loch Ness, refusing to let them have such a weapon. 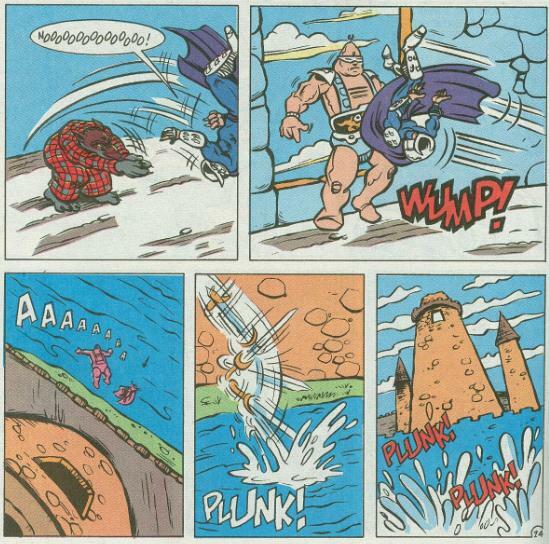 The distraction gives Splinter the chance to judo-flip Shredder into Krang and they both topple out of a window and into the Loch. April feels guilty, knowing that she was chosen to wield the sword by Elan but instead lost it forever to the depths of the Loch. Splinter tells her that she proved her worth by having the will to give up such a powerful weapon. Later, the Turtles help Uncle MacNeil open up the castle as a tourist attraction and are rewarded with the house specialty: Haggis Pizza. The Turtles find the dish delicious… at least until Uncle MacNeil tells them what it’s made of. *This story is continued from “Yo-Ho-Ho! And a Bottle of Mutagen!”. 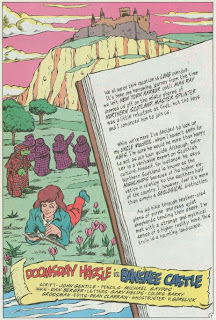 *I would place the prologue of this story, from the perspective of the future-Turtles, as being after the events of TMNT Adventures #44 but before TMNT Adventures #49. I have a hard time accurately gauging my feelings about this story. You see, were this an episode of the Fred Wolf TMNT cartoon (and it would have fit in perfectly during the European Tour arc of season 7), I’d have brushed it off as just another dull, plotless installment like 75% of the show. It really isn’t very special on the surface. 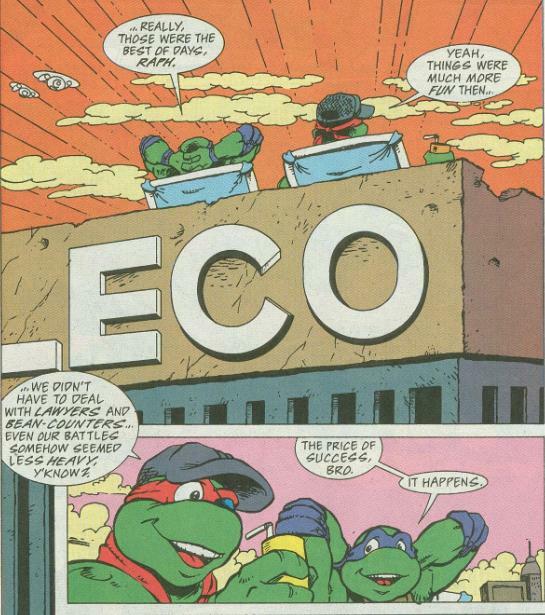 However, this isn’t an episode of the Fred Wolf cartoon, this is an issue of TMNT Adventures. And an issue of TMNT Adventures featuring the Shredder and Krang working together to menace the Turtles is actually a freakin’ rarity. 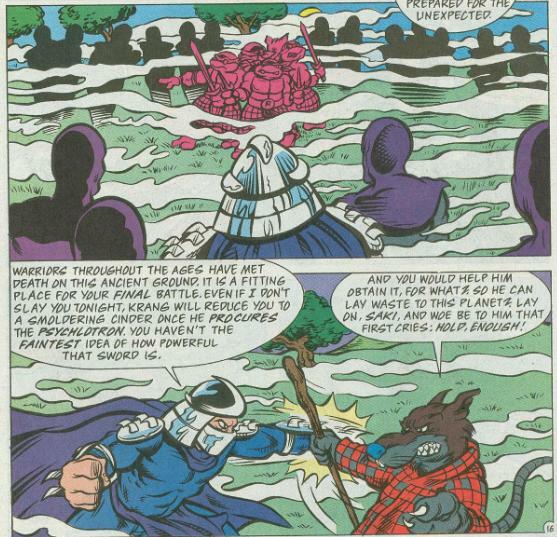 You see, by TMNT Adventures #13, the Shredder and Krang had severed their alliance and actually became adversaries for one story arc a little while later. As a matter of fact, Krang was practically a non-entity in this series. Not only are appearances by him uncommon, but appearances where he actually gets his hands dirty and enters the fray are even less frequent. With that in mind, “Doomsday Hassle in Banshee Castle” is actually one of the few TMNT Adventures Special stories of note. Most of the installments in these Specials are meaningless and have no reflection on the ongoing series; basically, you can skip the Specials and never miss a beat. Most of them aren’t even worth tracking down unless you’re actively looking for a good story; and there weren’t many of those in these things. But the fact that this issue gives us a “Shredder and Krang vs. the Turtles” story makes it worth picking up above other Specials. Again, it doesn’t sound like much on the surface, but once you’ve read TMNT Adventures all the way through, you’ll find yourself appreciating any appearance by Krang regardless of how inane it might be. Despite basically being a MacGuffin Hunt of a plot, “Doomsday Hassle in Banshee Castle” gives us some background history on both April and Krang, which is a nice bit of character-building. I’ll honestly take a peek into April’s Scottish roots over the utter nonsense that was churned out in the May East Saga miniseries. As for Krang, it’s interesting to know that he visited Earth before, centuries ago. Why he didn’t conquer it then, I have no idea, but one can surmise that his brief visit to Earth’s orbit while chasing the Plutonian warlord was what put our planet on his short list of worlds to conquer. You know, whenever he gets around to it. And in what I’m sure is a total coincidence, the origin and powers of the Sword of Destiny are strikingly similar to those of the Sword of Tengu featured in the 4Kids TMNT series. The prologue sounds random in summary format, but actually complements the goofiness of this story (which takes place way earlier in the book’s timeline than where the ongoing was at). There seemed to be a nostalgia for the carefree days of old going on at the time and this very typical “Krang and Shredder fight the Turtles over a doomsday weapon and lose in a hilarious fashion” certainly feels… “classic”. John Gentile’s script is even dotted with Fourth Wall gags, ala the Fred Wolf cartoon and early days of the TMNT Adventures comic. Michael Gaydos’s art seemed less refined than his usual output, which is disappointing as he’s one of my favorite infrequent series artists. It definitely doesn’t come close to matching his efforts on the Merdude miniseries. 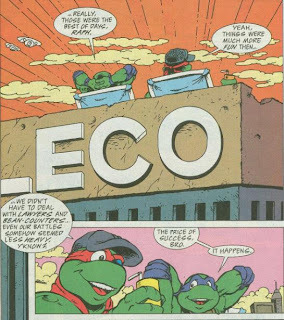 Anyway, the story-itself is rather ho-hum, and where it slots into the narrative timeline of TMNT Adventures can be a bit problematic/disruptive. Despite that, it’s always fun to see a Shredder/Krang story in this book, and you just didn’t get that many of them. Do you ever NOT take shots at the original cartoon whenever you can? Some of your reviews are quite grating since you seem to be spectacularly clueless of what the original cartoon was actually like. As good as TMNT Adventures was, there are many things about the original series that were just as good and fun to watch. Sometimes I wonder if you're a new Peter Laird. The Fred Wolf cartoon was a series with many, many flaws and I do illuminate them for my own entertainment quite frequently, yes. Even from an objective standpoint it was a very uneven series, and "uneven" is about as polite a description as it deserves. The animation was routinely substandard even for the era in which it was produced and the writing even more so. David Wise was a notorious hack and recycler of his own scripts; even his best offerings were often a mess of contradictions and an excess of halfbaked plots unmercifully loaded into what was clearly a first draft sent directly to the storyboarding stage with minimal editing or refinement. I am well acquainted with what the series was "really about". I watched it as a child and enjoyed it then, but I don't look to my nostalgic memories exclusively for perspective; I've bought every DVD release from Lions Gate thus far and have reacquainted myself with the show intimately. It has not aged well in the slightest and I'll never be any less than honest in my assessment of the show, hallowed as it may be amongst certain members of the fandom. The Fred Wolf series was a goofy, fourth wall-breaking comedy series designed first and foremost to promote a toy and merchandising line; that is what the series "was really about". But even by those standards, it was a directionless, ambitionless mess that spun its wheels season after season after season, retreading the same hollow, hackneyed and generic cartoon plots time and again. The Fred Wolf cartoon had its highpoints, particularly in the early seasons and the ending "red sky" seasons when it actively pursued focused, season-long story arcs and encouraged a serialized, progressive narrative. But while the bookending portions of the show may be enjoyable, it is the unsightly content inbetween that makes up what has to be more than 50% of its run. And that brings its grade point average down tremendously. TLDR; I make fun of the Fred Wolf cartoon because it deserves to be made fun of and I always back up my criticisms with examples if the situation calls for it. Sorry, Anonymous. i'm glad that the shredder always finds a window to escape through. lol@ Anonymous posters who rail against blog authors. There are probably few people in this world that enjoy the Fred Wolf TMNT cartoon as much as I do. Heck, I've recorded a couple dozen episode commentaries! But I love it in spite of its inherent ridiculousness, plot holes, frequently lazy animation (by today's standards anyway), and missed opportunities. I like self-contained, episodic storytelling, and self-referential humor. Anyhoo, all that to say that I also appreciated it when the Archie series decided to do the occasional comic book in the Fred Wolf style. It's just good, wacky fun!